Cover the potatoes with cold water in a pan and adda pinch of salt. Bring to the boil, then simmer for 15-20 minutes or until completely tender when pierced with the tip of a sharp knife. Drain in a colander and leave to cool completely.When the potatoes have cooled, peel away the skins and then grate into a bowl – you should end up with about 350g/12oz in total. Heat a frying pan and add the bacon and sauté for 2-3 minutes until cooked through and lightly golden. Stir in the spring onions and continue to fry for another minute or so until softened. Tip into the grated potatoes with the egg yolk and sprinkle in the flour. Season generously and mix until just combined. Divide the potato mixture into four and using a 10cm/4in cooking ring shape into patties, dusting with flour if neccessary. Arrange on a flat plate and cover loosely with cling film. Chill for at least 1 hour or up to 24 hours is fine to firm up. Preheat the grill and heat the oil in a large heavy-based frying pan. Add the butter and once it has stopped foaming, add the boxty potato cakes. Cookfor 2-3 minutes on each side until warmed through and golden brown. Meanwhile, arrange the pancetta on a grill rack and cook for 2-3 minutes until crisp and golden, turning once. Drain well on kitchen paper. 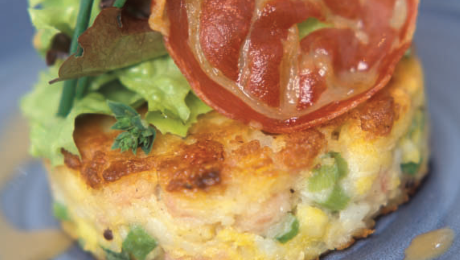 To serve, arrange the boxty potato cakes on warmed serving plates. Place the salad leaves in a bowl and quickly dress with the balsamic vinaigrette. Arrange a small pile on each potato cake and garnish with the pancetta and chives.